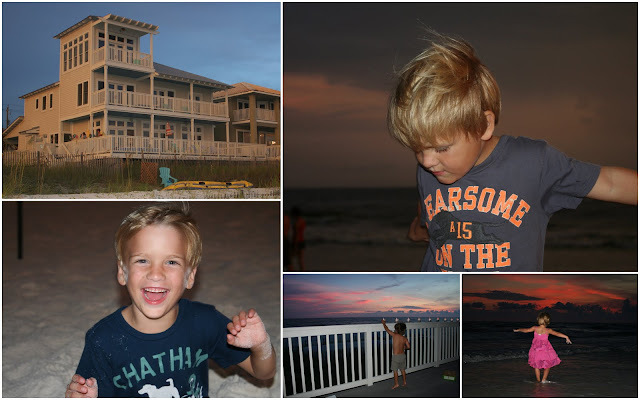 A few snapshots from our afternoon trip to neighboring Rosemary Beach. The resort is beautiful, everywhere you turn there are gorgeous homes, cobblestone streets and grassy parks woven through the town. This sweet park has darling playhouses and a big grass covered hill to race down on sandy trails. We had a wonderful vacation. I'm really to tired to post but we are at my mom's and off to Disney tomorrow so I thought I better capture a few thoughts before our next adventure begins. Let me just say that the beach is my favorite place to be. I love the sound of the waves, the salty air, long walks on the beach looking for seashells, the fresh seafood, the relaxed atmosphere. Bliss. The owners were so kind, they let us stay an extra couple of nights no charge, since the next guests were not due until Tuesday. We savored our extra days and celebrated our last night with lobster tails from our favorite seafood market Buddy's...they will steam your shrimp, scallops or lobster to go. We picked up Buddy's most nights as why mess with perfection. We spent hours swimming, wave riding and boating. David was the rafting tour guide. Our four were bouncing around, giggling, having a grand time. A man passed by and convinced Holden to get in the boat with his siblings. He only felt out once but David scooped him right up. That smile melts my heart, what a love bug. He can be a terror one minute and a charmer the next. I think that sums up the toddler years. Holden and Evan are always ready for a cuddle with me which is nice, until they end up in a tugging fight over who gets prime seating in my lap. I'm trying to soak it up as much as I can before they get too big to want to be held. Will on the other hand is all about Dad, he got lots of special one on one time surfing with Dad and was pretty proud to be hanging with Dad, commenting on how similar they were - even the same cold after getting out of the ocean. Holden likes to follow his big brother around, and wants the same things, the same color popsicle, whatever, if Will likes it, he wants it too. They are all getting so big. We marked their heights on the measuring wall at McBeach, they all grew ~4" over the year. Holden is not far behind the trio in height. The beach is perfect for puppies and boys. They can run, run, run with no holding back. This is the face of pure joy and freedom. Surfer girl Lily has her own ideas and is confident, independent and strong. She is a mother hen and calls her brothers, her boys. We were so glad Grammy and Papa could join, as well as my Mom and David's cousin Don. We can't get enough of these great beach sunsets. The evenings are gorgeous. Evan says the sky is 'awesome mom'. Thanks Don for joining us this week. You made McBeach even more fun! We are ready for vacation and are so excited to be headed back to McBeach. It has been crazy hot here all summer and although Florida is also warm it was 17 degrees cooler yesterday in Panama City than here in Austin. The kids have been asking all summer if we can go to the beach house right now. They remember so much from last year and talk about our last trip all the time, the bunk beds, the 'surfing', finding shells. So they are absolutely delighted to be finally packing. And to top things off this year we will be going to GG's house after the beach and ending our trip at Disney. I'm glad to end our summer on a good note. I wish I could say we had an easy care free summer but the heat has made it pretty dreadful. We have spent a ton of time swimming and the kids have all improved tremendously, everyone can swim 10 or more feet and Lily and Will are doing lots of diving and summersaults in water, they are like fish. But this past week or two we haven't even wanted to venture to the pool. The rest of our days have been filled with summer camps and Lily took ballet and art which she adores. I think they had fun, but the heat made summer camps with all the outdoor activites a bit rough. They are all looking foward to being back in school with their friends and everyone in Austin is ready for fall. By late September we usually get some repreive from the heat. We also moved my father into his assisted living aparment this summer, which was a huge job. It is a relief to have him settled and more care but there is still a ton to do to sort through his things, get all the finances in order and sell the house and car. So for now, I am looking forward to putting work and responsiblity aside and simply relaxing and enjoying some family time. I'll be posting some pics soon, my camera has been on the brink, but I got it repaired just in time for our trip. Lily had her summer ballet recital on Saturday. Here she is pretending that she is a clay statue while her instructor molds her into new poses.